Erin and Brett Lelko in their Oxford home. From left: Tyler Smith, Greg Driscoll, Nate Volz, Derek Needham and Mike Palermo will be serving in El Salvador for a month this summer. Members of the mission soccer team with islanders in El Salvador. Young players form a prayer circle at a soccer clinic. Teams play soccer for half a day at soccer schools in El Salvador. After a two-hour bus ride from the city of San Salvador, and a 45-minute switchback drive up a mountain, in a community where there is no electricity or running water, Erin and Brett Lelko have found a place where their faith turns into action. The young couple lives in Oxford and attends Andrews Bridge Christian Fellowship in Christiana, where they work with youth. In mid-June, they will return to El Salvador for the third time, working in places where poverty has not dimmed the warm spirit of people who are trying to improve their future. Erin is a veteran of mission trips with her family and youth groups, beginning when she was 12. She has worked with church-affiliated groups in the Bahamas, Mexico, Lithuania, Kenya and Zambia. She has found that the villagers in El Salvador – particularly the women and children – have a permanent place in her heart. 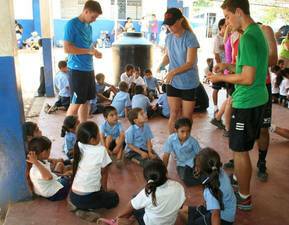 Mission workers play with children and lead by example. They are working under the auspices of Christ for the City International (CFCI), which has basic hostel-type accommodations in the city of San Salvador, where there is electricity and running water. “We can't drink the water, though, so they give us bottled warer,” Erin explained. The rooms are spartan, but when compared to the shacks shared by most of the country's people, they are luxurious. Erin and Brett laughed often during an interview last week as they looked forward to their return to the country where whey have made long-lasting friends. They will serve for a month, from June 15 to July 15, primarily at three sites – an island that is home to subsistence fishermen and farmers, a mountain called Jicalapa, and in a San Salvador school called Altavista that is in gang-dominated territory. They will work at established schools where students get half a day of academic instruction and half a day of soccer. The sport is universally loved in El Salvador, and the teams give young people a sense of belonging that is often lacking in homes where both parents work seven days a week to provide a meager income. Often, only a mother runs the household, further stretching the limited resources. Young people face a choice: Gangs or the soccer schools. The mission trip in El Salvador “is not a vacation,” Erin said, smiling. “We have a day of rest, and that is Sunday. We will attend church, and watch a soccer game. Monday through Saturday, we will be working. We're up at 6 and you get back to your place at 5, unless you make a meal for the homeless, and that's more like a 9 p.m. night." A second local mission group will come and assist the team for 10 days, from June 30 to July 9. Erin and Brett will be accompanied by five seniors from Wilmington Christian School this year. They share a passion for sports and for helping others. At the island location, the mission team will take a ferry that costs about $3. It's an amount that is beyond the reach of the people who live on the island, keeping the community trapped in an economy based on fishing and small farming. Schooling traditionally goes only to the ninth grade, so CFCI is trying to build more soccer schools as well as churches. The group works with local people to fund and construct the buildings, and then hires pastors and teachers from the local community. The construction process, though, is painfully slow. There are only two ways out of a gang, Erin said – dying, or turning to faith and shunning criminal activity. On the mountain, gangs are less of a presence. “The people say, 'We may be poor, but we are safe,” Erin said. The country is predominantly Catholic, but most families are too busy making a living to practice their faith in regular worship. In working with the families, mission team members lead by example, sharing the Bible and encouraging young people to choose education over the gangs. “People are just so welcoming,” Erin said. “We will take huge donation bags of clothes and books and shoes, and you'll enter these homes that are, for lack of a better word, huts. They'll say, 'Welcome to my home. Do you want anything to eat?' And you think, 'You don't have food. Please don't offer me anything.' But whatever they have, they want to give you. "I remember this one woman," Erin said. "I asked, 'How do you get money for food?' She said, 'We sell watermelon, and my daughter sells bracelets on the street.' Well, the street is a 45-minute drive down the mountain, so that's her whole day. Then I said, 'How do you get food?' She said, 'God gives us food. Every day. We won't go hungry.' Their faith is just outstanding." There is a shared well for more than 1,000 people who live on the mountain, and getting to it is an arduous 45-minute climb down, and a tougher climb up, laden with water buckets. But as hard as life is for families in El Salvador, Erin and Brett said they are struck by how determined people are to succeed. “I particularly relate to the coaches,” Brett said. “They are involved, 24/7. You wish you could do more for the coaches, because they want to do more, but they're so limited. You feel for them." There are success stories, like that of Henry, a student who thrived at school and has since gone on to a year of higher education, funded by financial support from CFCI and Team El Salvador. There is now a program in place to help others like Henry. He has returned to coach other young people and serve as an example. “He calls us mom and dad, even though we're a very young mom and dad,” Erin said, laughing. “He really loves visiting with our team, but he said, 'I can't. I have my own kids to coach. They rely on me.'" The members of the mission team pay their own way, helped by fundraisers and donations held throughout the southern Chester County area. In El Salvador, though, a little money goes a long way. “We paid off an entire bleacher project and we gave money to finish the church on the mountain, and I think that was only $1,300," Erin said. "But it's just a matter of the time it takes to get something done." Faced with what might seem an insurmountable problem, Erin and Brett take comfort in the fact that they are making a small difference. “The last time we were there, what really drove us to go back was when the coaches hugged us with tears in their eyes and said, 'Thank you for believing in what we're doing,'" Erin said. "That strikes you. To have a team come down continuously, they know that their need is seen." Avondale Presbyterian Church (420 Pennsylvania Ave., Avondale) is hosting a spaghetti lunch and silent auction to raise funds for Team El Salvador on May 31 from 11:30 a.m. to 2 p.m. For more information about the mission trip, visit www.andrewsbridge.com.